For experienced home cooks interested in learning or refining their skills in braising, roasting, and grilling, Slow Fires would be a valuable addition to their cookbook libraries. Arranged by sections on braising, roasting, then grilling, Slow Fires features detailed, step-by-step recipes for about 18 to 20 full meals per technique (about 60 meals overall). 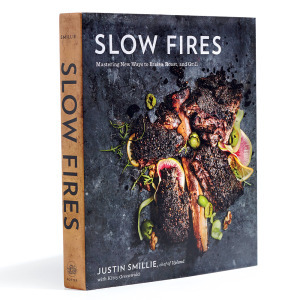 Justin Smillie, chef of New York’s Upland restaurant, kicks off his book with an informative over-all introduction to braising, roasting, and grilling, then offers focused introductions at the beginning of each new section. Each meal is accompanied by stunning photography that captures the mouth-watering beauty of every dish. An experienced chef, Smillie worked his way up the ranks at Mercer Kitchen and Grammercy Tavern. He worked with Jonathon Waxman at Barbuto and was chef at il Buco Alimentari e Vineria before opening Upland as chef-partner. Most meals are Italian in inspiration and feature a wealth of fish, pork, and red meat cuts, from braised oxtails and roasted Pancetta-Wrapped Halibut with Grated Tomato & Summer Squash to grilled Kaffir Lime Octopus with Perfect Chickpeas and Blistered Peppers. Vegetable entrees make appearances in the roasting and grilling section, including a Caramelized Caponata with Caper Vinaigrette and Herbed Mozzarella and Coal-Roasted Sweet Potatoes with Crème Fraiche Pomegranate, Olives, and Herbs. A Caramelized Five-Onion Soup with Spinach Salad is offered in Braising. Interestingly—and rather disappointingly–chicken is limited to only three entrees, one recipe per method. Slow Fires also features a final, fourth section, Foundations and Finishes, which wraps up the book with homemade recipes for many ingredients used in the book, such as Parmesan-Pecorino Broth, Preserved Lemons, Fresh Ricotta, and DIY Semi-Cured Salt Cod. Like the title says, these are not quickly prepared meals. The majority employ multi-day brining and extended cooking times. These are recipes that should be start mid-week for a Saturday or Sunday leisurely meal with friends and family in mind, when you have time to sit back and savor the meal and the results of your work. Happily, a boxed How to Plan This Meal accompanies each and every meal and is essential for the planning and cooking process. While Slow Fires is not for inexperienced cooks, do not be intimidated by the long recipes, here or in any other cookbook. Study the recipe, make notes, create a grocery list. In addition to learning or improving braising, roasting, and grilling techniques, many of Smillie’s recipes also help home cooks learn other kitchen techniques. For instance, Crisp Pork Belly Braised in Milk discusses how exactly to clean and portion pork belly. Salt-Roasted Bass with Green Grape Smash details how to clean and fillet a whole roasted fish prior to serving. I will certainly get plenty of use out of Slow Fires. Living in a near-Chicago suburb, I am spoiled by easy access to neighborhood produce markets, ethnic grocers, and fishmongers, as well as to several butchers, including those offering sustainably and humanely raised meat and poultry. If you live in a more sparsely populated or less diverse area, some substituting of perishable specialty ingredients and/or online purchasing of non-perishables may be required. Disclosure of Material Connection: I received Slow Fires by Justin Smillie through the Blogging for Books program free of cost in exchange for an honest review. I was not paid for my opinion. All of my opinions are mine and mine alone.